The Phantom 3 Professional continues the proud tradition of DJI’s Phantom series and brings several important innovations to the Phantom’s rich feature set. The Phantom 3 Professional carries a fully stabilized 3-axis 4k UHD video camera for smooth, crisp videos and still photos. To allow you to see what the drone sees, DJI has engineered a new generation of their Lightbridge technology that allows 720p HD digital streaming of live video directly from the drone. You can control the camera and see video in real time as you fly and you can even share the video using the DJI Pilot app’s advanced features. To aid indoor flying, the Phantom 3 Professional includes an integrated array of optical and ultrasonic sensors call Vision Positioning that allows you to fly precisely indoors without a GPS signal. 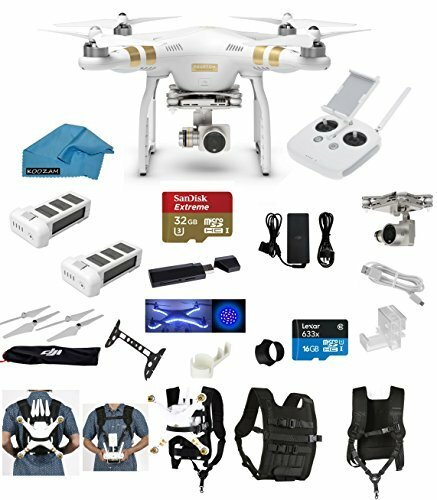 The Phantom 3 Professional includes all the tried-and-true features you’d expect from a DJI drone, including GPS navigation with auto takeoffs and auto landings, intelligent high power flight battery, a built-in safety database of no fly zones, and a powerful mobile app for your iOS or Android device. Note: DJI has locked your Phantom from being able to even start the motor if you live within a 15 mile radius of the White House. This encompasses not only D.C. but much of Prince Georges County, Arlington, Fairfax, Silver Spring, Falls Church and Montgomery County. DJI does not warn you of this prior to purchase. Outside of this 15 mile radius, the drone works great, but be aware, that if you bought it and live within the restricted zone, you will not be able to fly it, even on your own property.